We have been producing green hydrogen from wind power in the hybrid power plant by means of electrolysis since 2011, which is used for heating purposes, for refuelling cars and busses and in industrial processes, among others. 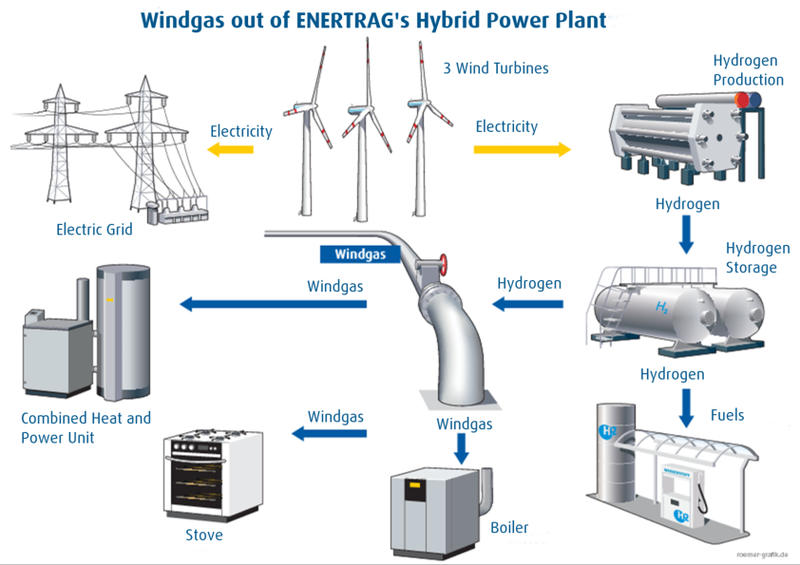 Likewise, the green hydrogen which is produced completely without CO2 emissions, is used today already under the brand name ENERTRAG Windgas to supply fuel cells in emergency power supply units. The hybrid power plant consists of 3 wind turbines, type Enercon E-82, and two motor cogeneration plants that can be operated on biogas as well as on a blend of biogas and hydrogen. Hydrogen is manufactured from wind power at times of strong winds and is stored; when required, the hydrogen is converted to into electrical energy again. With the storage of energy in the form of hydrogen, the secure delivery of energy can also be ensured in windless conditions. Hydrogen is an environmentally friendly energy source that makes it possible to store large energy quantities over a long period of time. Collection or delivery according to individual agreement.